Water quality in our lakes is often closely tied to the critters that call the water home. In the last decade, two tiny species have had a huge impact on local water quality. Read on to learn more about the native, algae-eating Daphnia — and the invasive spiny water flea that now feed on Daphnia. Daphnia. Photo courtesy the Wilson Lab at Auburn University. Daphnia are tiny, floating freshwater crustaceans – there are actually more than one hundred species! In Lake Mendota, Daphnia are generally very abundant AND voraciously consume algae. We like to think of them as friendly-looking creatures that graze on algae much like a cow. While many familiar crustaceans such as crabs and lobsters use their legs for walking or swimming, Daphnia’s legs beat to continuously draw water across their mouth parts, filtering out edible particles. A typical Daphnia diet includes single-celled algae, along with protists, bacteria, and other floating goodies in the water. To swim, Daphnia use a large pair of antennae to propel themselves through the water with abrupt movements, making them easy to spot in a jar of clear lake water. What is the life of a Daphnia like? Like many small zooplankton, Daphnia need to be able to reproduce quickly when the time is right. 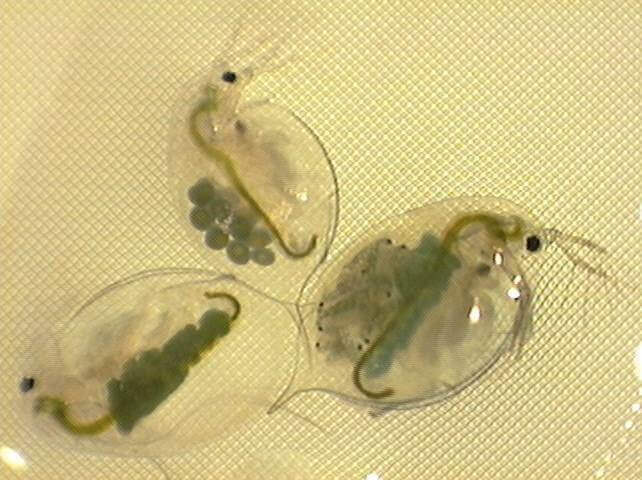 When food is abundant and predators are not, female Daphnia will produce many fertile eggs without help from males, which allows the population to grow very rapidly. Juveniles are able to produce their own eggs after only a week, and may continue to reproduce every few days until death. When food becomes scarce, Daphnia begin producing sturdy “resting eggs” protected by a special casing. A resting egg might hitch a ride on a duck’s feet to a new lake, or it might wait on the lake bottom for over a century and hatch when conditions are better. Why are Daphnia good for our lakes? We love to see Daphnia in our lakes, because these tiny grazers have such a large appetite for algae that they can play a huge role in keeping the water clear. Generally, the lakes are clearer when populations of Daphnia are high. Daphnia pulicaria and Daphnia mendotae are the two most common Daphnia species in our lakes. Can Daphnia eat blue-green algae? Not really. Some Daphnia have been observed eating some types of blue-green algae (cyanobacteria), but it is generally considered to be a poor source of food, and Daphnia will not be able to control the large blooms that appear on our lakes. Some studies suggest that Daphnia can “taste” cyanobacteria and will avoid ingesting it when other food, such as green algae, is available. During a thick bloom, Daphnia have to spend more time and energy filtering, and the toxins some cyanobacteria produce can also take a toll. How have conditions for Daphnia changed over time? In the late 1980s, an extraordinary experiment took place in lake Mendota. The goal was to improve water clarity by reducing the number of fish eating Daphnia, allowing the population of these grazers to expand and keep floating algae in check. For several years, managers stocked large predatory fish like young walleye and pike to the lake to reduce the number of cisco and yellow perch, species that prey upon Daphnia. In the years following, the larger, hungrier Daphnia pulicaria came to become the dominant zooplankton in the lake, and water clarity increased! Overall, the experiment is considered a success, especially because the stocking also improved the pike and walleye fishery in the Madison lakes. However, recently a new species has appeared on the scene in the Yahara lakes to threaten Daphnia once again. What is the Spiny Water Flea? Spiny Water Flea. Photo courtesy UW-Madison Center for Limnology. The Spiny Water Flea (Bythotrephes longimanus) is native to the freshwater lakes of Europe and Asia. It made its way to the Great Lakes by 1984 and probably reached our lakes not long after. Like Daphnia, which is also a type of water flea, Spiny Water Fleas can either reproduce asexually, to achieve very dense populations, or sexually, to produce hardy resting eggs. Unfortunately, Daphnia are a favorite prey of the larger B. longimanus. Spiny water flea are “messy eaters” that tear up and consume Daphnia in large numbers, devastating their populations. 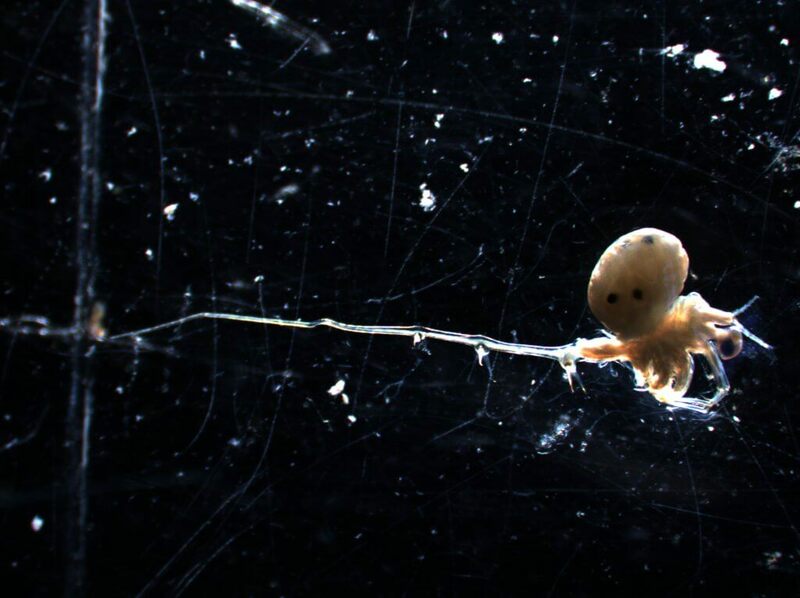 How is the Spiny Water Flea changing our lakes? While this invader probably existed in low densities in Lake Mendota for decades, its population exploded after an unusually cool early summer in 2009. This was disastrous for Daphnia pulicaria, the larger Daphnia species that is most effective at grazing algae. The water fleas’ success in 2009 allowed it lay down huge amount of resting eggs that helped the population maintain its high density in 2010 despite the return of normal temperatures. Since 2009, Lake Mendota has lost about 3 feet of water clarity, and more than half of the biomass of Daphnia pulicaria. This is partly because the highest densities of Spiny Water Flea occur in the fall, when Daphnia should be producing resting eggs to reinvigorate the population when spring comes. Now that Spiny Water Fleas have invaded the Madison lakes, the most important thing we can do is to make sure that we do not spread them further. To prevent the spread of Spiny Water Flea, follow Wisconsin Department of Natural Resources regulations, including draining all water from your boat and thoroughly washing it before taking your boat anywhere else. Because the water flea is so small, it is probably in the Madison lakes to stay. As research continues, strategies to suppress the population of water fleas could emerge. For now, our best bet is to continue to keep algae-feeding phosphorus pollution out of the lakes! Once an invasive species enters a lake, there’s not too much we can do. But we CAN control phosphorus pollution, which is the main culprit behind smelly algae blooms and closed beaches. Clean Lakes Alliance is working to cut phosphorus loading to our lakes in half. Donate to become a Friend of Clean Lakes today.